The Rion Base was engineered to provide additional stability or additional head room for Rion EcoGrow 2 Greenhouse sized 6’ x 6’. Manufactured with heavy duty 100% UV-protected resins and engineered with a U-shape, honeycomb design for extra durability. 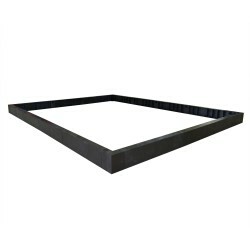 Engineered to provide additional stability and extra height for your Rion EcoGrow Greenhouse. 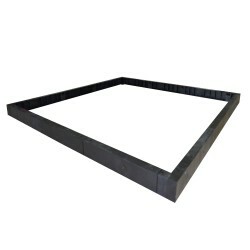 The Rion Base was engineered to provide additional stability or additional head room for Rion Greenhouse sized 8’ x 8’. Manufactured with heavy duty 100% UV-protected resins and engineered with a U-shape, honeycomb design for extra durability. The Rion Base was engineered to provide additional stability or additional head room for Rion EcoGrow 2 Greenhouse sized 6’ x 10’. Manufactured with heavy duty 100% UV-protected resins and engineered with a U-shape, honeycomb design for extra durability. The Rion Base was engineered to provide additional stability or additional head room for Rion EcoGrow 2 Greenhouse sized 6’ x 12’. The Rion Base was engineered to provide additional stability or additional head room for Rion Greenhouse sized 8’ x 20’. Manufactured with heavy duty 100% UV-protected resins and engineered with a U-shape, honeycomb design for extra durability. 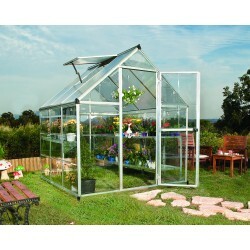 The Palram Nature Hybrid series greenhouse brings hobby gardeners the best of both worlds; the precise balance of two advanced polycarbonates and a durable 6’ foot wide frame designed perfectly for smaller spaces and your growing needs.On Sale Until April 30th!Only While Supplies LastFREE Fast Shipping!